Although the story of the kidnapped baby, the distraught parents, and the misery when the child is discovered and returned has been told before in Jacqueline Mitchard’s The Deep End of the Ocean – M.L. Stedman offers her “ocean” tale with an Australian twist in The Light Between Oceans. With the same unnerving trauma, this story adds spectacular descriptions of the lighthouses along the western coast of the continent and life in post-war Australia. The story opens with the romance of a young bride, Isabel, and Tom, a returning World War I soldier with a new job as the lighthouse keeper on an isolated island; their lives on Janus Rock seem idyllic. The outside world intrudes only every three months when the supply boat delivers essentials to their outlying post. But three miscarriages and no hope of a family crush their resolve, until a boat washes up on their island with a dead man and a live infant girl. Their decision to bury the man quietly and keep the infant as the replacement for Isabel’s dead baby is the catalyst for the slow unraveling of their lives. The deception works because they are isolated on their Rock and can forget the existence of the world outside. Struggling with misplaced loyalty to his wife and the realization that he has destroyed the life of the real mother, a woman he inadvertently rescued when he first sailed to Australia, Tom follows his unconscious need to be discovered and leaves clues that trigger the investigation. The misery that follows for baby Lucy and her mothers is predictable, but Stedman injects some suspense with the possibility that Isabel will betray Tom for revenge. Although the ending is maudlin, the story and the setting are nonetheless captivating. 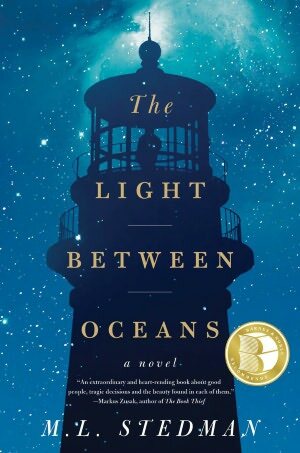 This entry was posted in authors, book review, books, history, reading and tagged Australia, Isabel, Light Between Oceans, Lighthouse, Lighthouse keeper, ML Stedman, Tom. Bookmark the permalink.